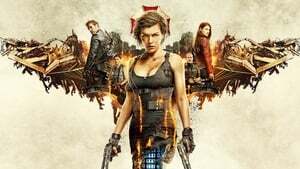 Sixth installment in the series, Resident Evil: The Final Chapter is a sci-fi horror action movie. The movie is writer and directed by the Paul W.S. Anderson. As the name says, this is final part of the series. The plot of this movie is based on the video game like its prequel. The past installment of this series was huge success which is why it was no surprise that the final part was already extremely hyped up before the released. The movie however, received mix reviews. The story begins with Dr James Marcus, who is original founder of Umbrella Corporations, and his daughter dying from the premature aging. Like any father, he was really desperate to save his little girl and was looking at everything he can do. During his search, he comes across T-virus. The virus like any other dreadful thing has some serious side effects that Marcus soon starts to discover. Following the events from previous film, after facing betrayal from the Wesker, Alice wakes up in White house which is ruined by all means. During her search to find the survivors, Red Queen shows up to instruct Alice that she must go back to Hive in the Raccoon city within next 48 hours, informing her about the T-virus and its deadly side effects. The movie has a lot of links with the previous films which shows the connection between them. On her way to the city, Isaacs captures Alice, however, she manages to escape him. On her arrival to Raccoon City, she realizes that it is totally destroyed. Soon she meets Doc, Christian, Razor, Abigail, Cobalt and survive of Arcadia’s attack, Claire Redfield. The final chapter of this series was long due and the return it made to the survival horror is worth the wait. Anyone who has been following this series since the first installment can point out a drastic change, in a good sense. The story moves on with the group prepares to fight against the horde of the zombies and armored vehicles coming on their way. They manage to defeat all the enemy forces. However, they end up losing Cobalt during this fight. With another group of horde coming their way, they do not have time to grief over the loss of Cobalt since they have another battle to prepare for. Cobalt is not the only group member who dies. Soon after Cobalt’s death, the group of survivor along with Alice realize they do not have enough defense left to fight the battle which is why they decide to enter Hive entrance which is locate right at the bottom of nuclear bomb, the one that destroyed the entire city. Wesker, who has taken over the control of Hives, releases his dogs that end up killing Christian along with two other survivors. The movie goes on with the struggle for survival and Alice finding out the reason why Red Queen has decided to go against her creators. The movie is little bit let down as compare to its prequels, however It is still worth watching.